I don't know about you but I always like to try and buy British. The new Marks & Spencer collection celebrates British design, craftsmanship and manufacture so I'm pretty excited about the launch and can't wait to see it in stores. 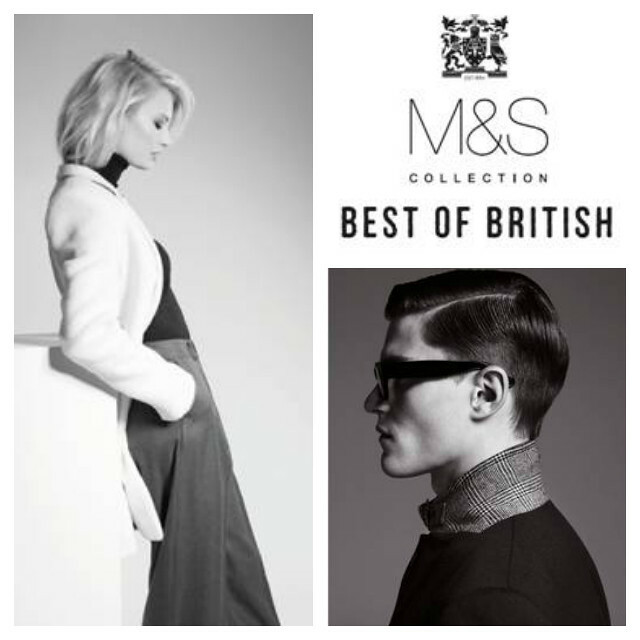 Best of British, has both womenswear and menswear lines, combining a rich heritage of traditionally made fabrics with chic, modern styling. Q: What is the Best of British Collection? A: It’s a 34 piece collection celebrating the best in British design and manufacture. It’s made up of an edited selection of premium wardrobe classics and investment pieces inspired by our heritage but modern in both design and cut. The clothing is complemented by a select edit of key accessories including brogues and Chelsea boots handcrafted by traditional British shoemakers, and oversized wool wraps made in soft, warm lambswool and finished in heritage checks. Q: What were the inspirations behind the designs? A: British heritage is very evident throughout the womenswear collection from the cloths used down to the pieces themselves. There’s also a distinct androgynous feel, with several pieces very much influenced by masculine styling. We were also inspired by quintessentially British pieces like the Peacoat, the Trenchcoat and the Chelsea boot and have created new takes on these wardrobe classics. Q: How does this range differ in style and composition to M&S’ other ranges? A: This collection is at the more premium end of our offering which has enabled us to use luxury fabrics and trims on our garments. The collection also has a very defined colour palette of neutral tones, monochrome with pops of hot pink which sets it apart from our other M&S collections. Q: Tell me a bit about the manufacturers you used? A: As we have so much home grown talent in Britain, we feel strongly about continuing to support and champion these manufacturers to ensure they will still be creating great clothing in the years to come. We have worked 6 British companies for the womenswear collection including Manchester based Cooper & Stollbrand, known for their quality of their hand crafted outerwear and painstaking attention to detail and NPS Shoes Ltd who have manufactured the brogues and Chelsea boots in the Best of British collection. Q: Which are your favourite pieces and why? A: Particular favourites of mine include the iconic tweed suit as I love the contrast between the rich, heritage fabric and the super slim, modern cut and the pink check cocoon coat which is the perfect statement winter coat. Q: What’s the price range of the collection? A: Prices range from £45 for a wool wrap and £349 for the pea coat and sizes range from 8 – 18. Q: When is the collection available to buy?